*Snow. Yes, there’s snow on Captiva and you can find it only at ‘Tween Waters. With a giant snow machine sending out the fluffy white stuff, you can celebrate in your shorts, while enjoying this Christmas miracle. *Food. For the first time ever, visitors can get the VIP treatment by joining ‘Tween Waters in the Wakefield Room and watch the show from the balcony. It includes a family style Italian Buffet and family seating, for just $37/adult and $18/child. That’s a steal, for the best seats in the house! If you aren’t interested in the VIP treatment, you can also enjoy a meal in the Crow’s Nest (special menu) or grab a hot dog and chips, or burger and chips, at the outdoor event! *Music. Not only is CJ the DJ rocking it poolside all afternoon, and part of the evening, but the Gatlins are returning to Captiva for some live music performances starting at 8:30PM in the Crow’s Nest. During the lighting ceremony, there is a music and lights show, and some live caroling. *Lights. With 100,000 twinkling lights, all played and synchronized to the holiday music, the light show is by far the most magical moment of the night. From the candy cane palm tree tunnel, to Rudolph leading Santa’s sleigh, there is no other holiday display like it in the world. 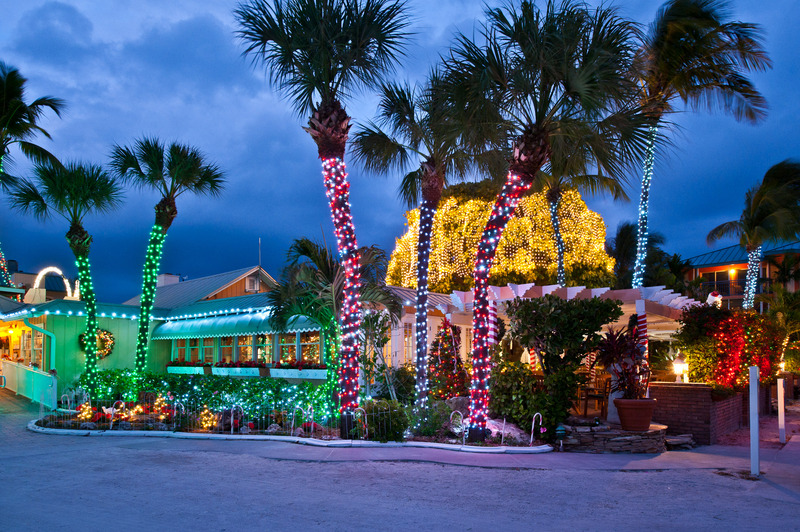 Without any street lights on Captiva, this display is made extra special because it truly lights up the night and can be seen from the beach and beyond.